After the challenges and difficulties of Vietnamese textile and garment industry in the early months of 2017, this sector has been showing signs of happiness ... However, the industry faces increasing competition pressure. with neighbors. According to the Vietnam Textile and Garment Association, by the end of the third quarter of 2017, the export turnover of the whole industry reached nearly $ 23 billion. It is forecasted that the turnover in the fourth quarter of 2017 could reach US $ 8 billion, bringing the total export turnover to US $ 31 billion, up 10% over 2016. If this number is reached, Vietnam will rank 26th Among the countries with large export turnover in the world. This result is thanks to the enterprises (DN) overcome difficulties in the first months of the year; Invest in improving the production system, focusing on a number of strengths, meeting the market demand, making the export situation of the sector significantly improved. 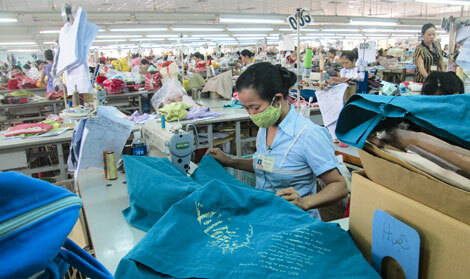 Vietnam has nearly 6,000 textile and garment enterprises and more than 2.5 million workers in this field. Over the past 10 years, the growth rate of this sector has increased by 17% / year. However, 2016 is considered as the most difficult year in 10 years, estimated revenue is only 29 billion dollars. Although Vietnam is one of the top five exporters of textiles and garments in the world, Vietnam now imports a large amount of garment and textile materials, most of which are dependent on China and South Korea. "Thanks to the beginning of 2017, the Vietnamese textile and garment industry has improved, trying to improve the quality of products, stable and reasonable prices, thus increasing the number of investors ordering" , which is the rating of the American Apparel and Footwear Association (AAFA). Vietnam is the second largest exporter after China in the US market. Vietnam's exports to the United States in the textile and clothing sector may continue to increase in the future even if there is no TPP (Trans-Pacific Partnership Agreement). The abundant goods, many orders, abundant are the signals for this branch of our country. However, in another reality, Vietnam faces the most difficulties in terms of unit price, as many areas of the market are tending to reduce impact on Vietnam textile in the future. In addition, the world textile market is expected to compete increasingly fierce, not only China but many other countries such as Myanmar, Cambodia ... increase the pressure on market share with Vietnam in large areas . Vu Duc Giang, a specialist in the textile and garment industry in Vietnam, said that the lack of linkage among enterprises in the industry together made the competitiveness of the textile and garment industry difficult. Therefore, in the coming time, in order to ensure sustainable export, the industry needs to form a chain linking yarn, textile, dyeing and sewing to create high added value products. Focus on core investment, selective, avoid spreading. At the same time, domestic markets should not be overlooked, products should be developed in line with local consumers' preferences, branding and consumption channels. Many experts said that domestic enterprises in the textile and garment sector are mainly small and medium enterprises, lack of capital, lack of investment, weak economic potential but lack of linkage, so the competitiveness is not. high. In order to seize the opportunities, besides investing in technology, enterprises should continue to increase the domestic rate, limit import, training for designers ... Vietnam Textile Association said only In the case of textile products, domestic enterprises have to import up to 86% for production and export, because the quality of domestic fabrics has not met the requirements of the main export markets of textiles. Economic expert Hoang Minh Tien said that in the face of difficulties and challenges for the textile and garment industry, the industry needs to change production methods in line with the requirements and standards that the importing countries request. In addition, enterprises need to improve their competitiveness, invest more in technology, new technology with higher productivity. The Vietnam Textile and Garment Association recommends enterprises to adapt to the market situation, accept the order change in order to minimize damage to enterprises; Expand the domestic market with diversified products to achieve the target.